Witnessing bullying is leaving many young people feeling stressed and scared, but many are unlikely to do anything to stop it happening, according to a survey. Campaigners are urging youngsters to turn from "bystanders into upstanders" and safely report bullying when they see it. The poll of more than 9,000 UK 12 to 20-year-olds, published by Ditch the Label, also raises concerns about the impact on those who are the victims of bullying, suggesting it is leaving youngsters feeling anxious, depressed or having suicidal thoughts. Overall, more than one in five (22%) said that they have witnessed bullying. A fifth of these (20%) said it had made them feel stressed, while a similar proportion (18%) said it left them scared it would happen to them. Around three in five (59%) felt bad for the person being bullied, while two in five (39%) felt upset. Just over one in five (22%) said they were not affected. The poll also concludes that while around half (51%) of those who had witnessed bullying said they sometimes intervened to stop it, and 17% said they always did, nearly one in four (23%) said that they rarely stepped in, and around one in 10 (9%) said they never did. Ditch the Label's chief executive Liam Hackett said: "Unfortunately, bullying remains a real issue in the UK. "The never-ending development of new online platforms means there are more places than ever that young people can witness bullying or be bullied themselves. "We work closely with the senior moderations teams at the leading social networks as trusted flaggers - meaning we can have the most abusive online content removed within 48 hours once it's been reported to us through our site. "We need more of those people who witness bullying to turn from bystanders into upstanders, by safely reporting what they see." The survey found that 22% of the youngsters polled said that they have been bullied in the last 12 months, with just 2% admitting that they have bullied someone. Asked why they thought they were bullied, more than half (57%) said it was because of attitudes towards their appearance - the most common answer - followed by attitudes towards interests or hobbies (40%), and attitudes towards the clothes they wear (24%). Most commonly, youngsters said they had been bullied by a classmate (59%), with a third (33%) saying the perpetrator was someone at school they do not know, and the same proportion saying it was an ex-friend. Other findings show that nearly one in 10 (9%) say they were bullied by someone they only know online and the same proportion said they were bullied by a teacher. Half (50%) of those who said they were bullied said it made them feel depressed, with 45% saying it made them anxious and a third (34%) saying they had had suicidal thoughts. In addition, more than one in four bullying victims (28%) had self-harmed while around a fifth (21%) had played truant from school or college. 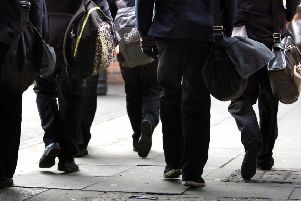 In a message in the report, Children's Commissioner for England Anne Longfield said it was worrying that one in five children are experiencing some form of bullying. "The impact bullying has on children can be enormous, affecting a child's confidence, self-esteem and their mental health," she said. "More needs to be done at home and in schools to help those who are the victims of bullying and also, crucially, to prevent children from bullying in the first place. "Children who are experiencing bullying need to know that they can approach their parents, teachers or Ditch the Label to talk about what they are experiencing." A Department for Education spokesman said: "Bullying of any kind is totally unacceptable. Schools should be safe places for all pupils and they are required by law to have a behaviour policy in place to prevent all forms of bullying." - The survey questioned 9,150 young people in the UK between November and February.